Do you start your day with a cup of coffee or tea? If so, then you benefit from the efforts of those skilled in the field of mechatronics. “We prepare students to work on electrical and mechanical systems that cross every industry, and that includes the equipment used to pack coffees and teas,” says Thomas Stout, dean of science, technology, engineering and math at Tidewater Community College’s Chesapeake Campus. Mechatronics prepares workers like no other, and is the only program of its kind in Hampton Roads. 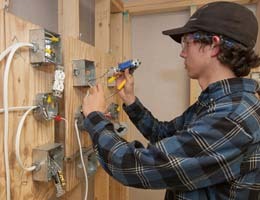 The program covers motor controls, hydraulics, computer programming, pneumatics, programmable logic controllers and more. Offered at the Chesapeake Campus since 2000, the degree program trains workers to advance in the field and prepares students for work in new construction, maintenance and on assembly lines in major manufacturing plants. Mechatronics is suited for technically savvy students who enjoy hands-on work. Students spend 40 to 50 percent of the time in classroom instruction and the rest in state-of-the-art laboratories. Chesapeake Public Schools and TCC launched a dual-enrollment program in mechatronics in fall 2014. Participating students earn their high school diplomas while preparing for in-demand jobs in advanced manufacturing. Students take selected classes during the first two years of high school, working toward a standard high school diploma and a recognized industry credential in electronics. During the final two years of high school, students take some classes in their high school, while taking classes at TCC, where they get hands-on training in the Precision Machining Lab and earn the TCC Career Studies Certificate in Mechatronics. After high school graduation, students can continue their education at TCC and earn the Associate of Applied Science in Mechatronics in just one year. 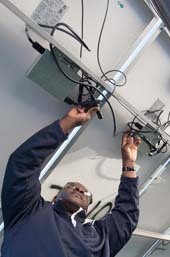 The college also offers career studies certificate programs for Computer Numerical Control Operator, Basic Metal and Plastic Machine Operator, Marine Electrical, Renewable Energy Technologies and Fiber and Data Cabling Installation. Students interested in mechatronics can apply for a CIBA Foundation scholarship. Graduate Justin McDaniel, a CIBA scholar, is now employed full-time with Plug Power.